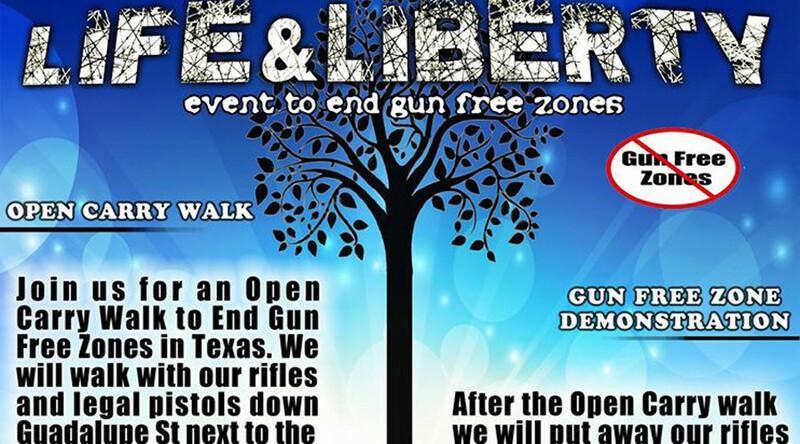 Gun rights activists announced that they are to hold an ‘Open Carry’ march and rally, and will stage a fake mass shooting theatrical event at the University of Texas, this weekend. UT Austin said that any such event would be considered trespassing. Multiple gun rights groups in Austin, Texas will participate in the event on Saturday to protest gun-free zones, as well as US President Barack Obama’s call for tougher gun control legislation. The event, titled Life and Liberty to End Gun-Free Zones, will take place just a week after the mass shooting in San Bernardino, California. "In the wake of yet another gun free zone shooting, Obama is using it to aggressively push his gun confiscation agenda," the Facebook page for the event read. "Now is the time to stand up, take a walk, speak out against the lies and put an end to the gun free killing zones." Posters for the protest use imagery often associated with environmental events, featuring a large "tree of life" with spreading roots in front of sun rays. The poster puts out a call for “crisis” actors for the mock mass shooting performance. “After the Open Carry walk we will put away our rifles and walk back to act out a theatrical performance,” the poster reads. The protest will begin at 12 noon in Austin, with gun owners marching with loaded weapons, while the performance is scheduled to start at 2:30pm on campus. A spokesman for the two participating gun rights groups, Come and Take It Texas and DontComply.com, told the Austin American-Statesman the event will involve using fake blood and bullhorns to mimic gunshots. Spokesman Matthew Short also told the Austin American-Statesman the group did not seek a permit for the event from either the city or the university. “We love freedom and we’re trying to make more freedom,” said Short. UT Austin told RT they were aware of media reports about the outside group’s intention to stage a performance of a mass shooting on the campus, but that, like all groups, they will not be allowed to hold the event. Bird said the university suggests the organizers conduct their event elsewhere, and that the Dean of Students Office is trying to get in touch with the organizers to ensure they are aware of the rules. RT reached out to protest organizers from DontComply.com and CATITX.com (Come and Take It Texas) for comment, but they did not respond prior to publication. State lawmakers in June passed legislation making Texas the eighth state in the country to allow students to carry concealed weapons on campus. The new campus carry law, which goes into effect in August 2016, will allow people with concealed weapons permits to carry their handguns into dorms, classrooms and other public university buildings, though universities may draft some campus-specific rules that may include limited gun-free zones. "We want criminals to fear the public being armed," Short said to the Austin American-Statesman. "An armed society is a polite society." UT Austin was itself the site of a mass shooting attack in 1966, when engineering student Charles Whitman shot 14 people after killing his wife and his mother, and injured 32 others from the UT Clock Tower before he was killed by police.